There are just a few days in an year when we can indulge ourselves with an extravagant escape on an exotic island where we can lounge on the white sand beach, sip on a delicious cocktail and admire the blue waves as they caress the shore. Nowadays, a long holiday is a luxury for most of us, something that would irreparably affect our work and because of this we prefer to take as few vacations as possible. This is why the weekend became our best chance for relaxation, rest and fun. We now invest all our efforts into planning the perfect weekends away from home, from all the work, stress and personal complications. And what can be more delightful than a couple of days on a paradise island enjoying the warm sea breeze and discovering the hidden secrets of an idyllic getaway? Of course, there are many possibilities for spending a perfect weekend, but most tourists prefer the exotic allure of the Thai islands. These are considered an endless source of cultural mysteries, delicious savors, thrilling experiences and decadent opulence. And right in the Gulf of Thailand there is a spectacular island with white pristine sand, warm emerald waters and charming ambiance. This island is called Koh Samui and it is a very popular tourist destination for both high end and low budget travellers. Its hypnotism consists in its amazing diversity. It is a place where the ingenuity of a wild paradise meets the innovation of a commercial tourist destination. It has everything you could possibly want during a very delightful weekend at the beach: water sports, boat tours, jungle safari, vibrant night life, temples, zoos, exquisite international cuisines, new age spa treatments and luxury accommodations with extravagant amenities and infinity pools. 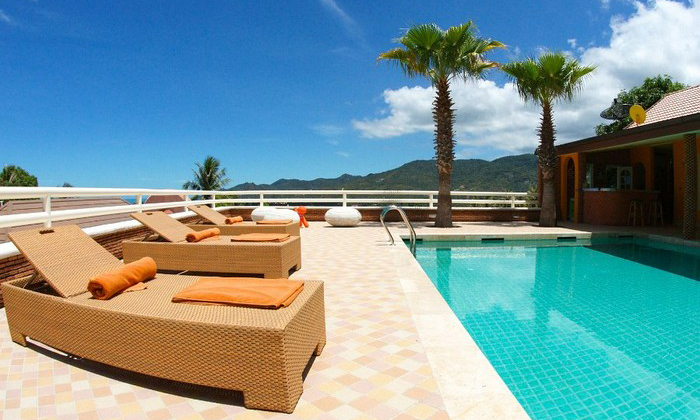 Where To Stay In Koh Samui? When travelling on this idyllic island, you need to make sure you rent the perfect property, one that is able to offer you the exquisite feel of a 5 stars hotel and the intimacy and comfort you had back home. Of course, it must be located in a spectacular area where you can enjoy the most impressive views and the allure of an exclusive private villa. And let’s not forget that proximity to the most beautiful beaches, best restaurants, popular night clubs and shopping centers is also very important. 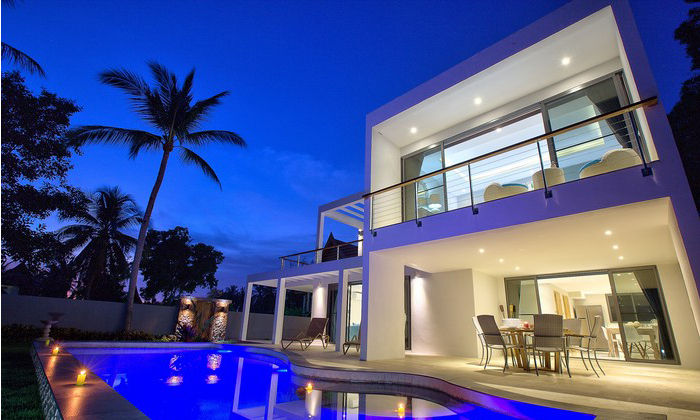 Luckily for us Koh Samui real estate is flourishing more than ever and it has an impressive collection of modern and beautiful properties for all tastes and budgets. 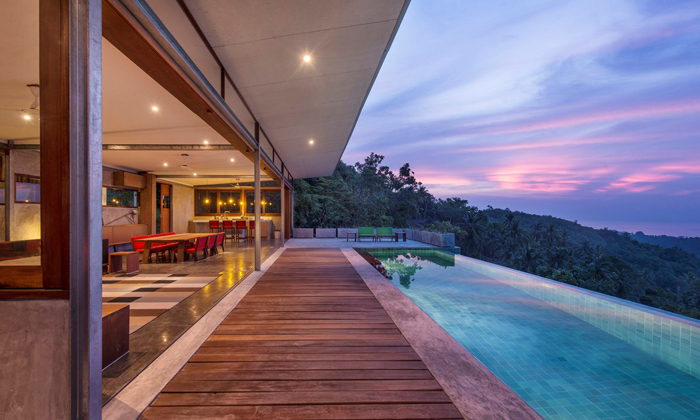 What can be more beautiful and extravagant then staying for a whole weekend in a luxurious 3 bedroom villa located on top of a lush green hill in Koh Samui from where you can admire majestic scenery while relaxing in your very own infinity pool? The villa is decorated in a minimalistic style and features modern furniture and amenities. The location is very quiet and private, with an exclusive position among the jungle surroundings making it the perfect choice for those who want to escape for two days in a serene and relaxing place. This elegant villa is perfect for families or groups of friends who are visiting Koh Samui for a whole weekend and want to enjoy the same comfort and privacy as back home. The property is simply beautiful and it can easily accommodate 10 to 13 persons as it is organized into 5 different building positioned around an alluring swimming pool that includes a smaller kids pool as well. And the best part about this beautiful villa is that it is located in a higher side of the island indulging you with breath-taking views of the ocean, coconut palm trees and limestone mountains. And the interior of this extravagant property is also impressive. Elegance and high end amenities can be found at each step, the house itself is a proof that luxury and comfort are what really makes a holiday memorable. 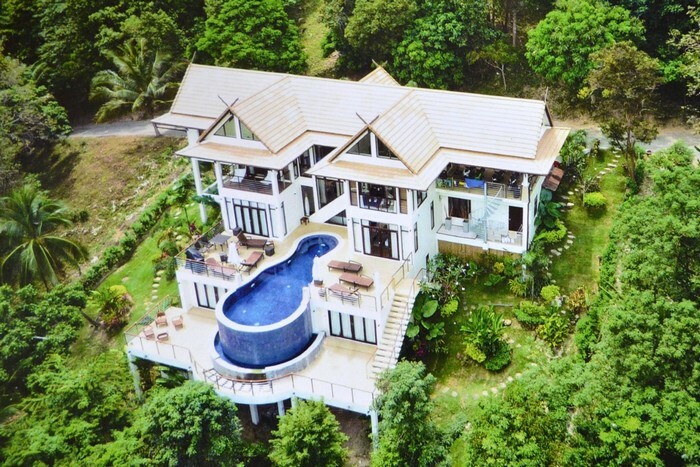 There are many impressive things about this luxury villa and one of them is the fact that it is right on a tropical green hillside and offers some of the most beautiful scenery of the north coast of Koh Samui. It is simple, but very elegant and spacious. Staying a weekend here means enjoying the feeling of swimming in an infinity pool which faces the spectacular landscaped gardens and the lush jungle below. The interior of this 4 bedrooms villa is decorated with refined furniture and equipped with high end appliances and gadgets. Everything is state of the art, sleek and modern- perfect for a dream beach getaway. 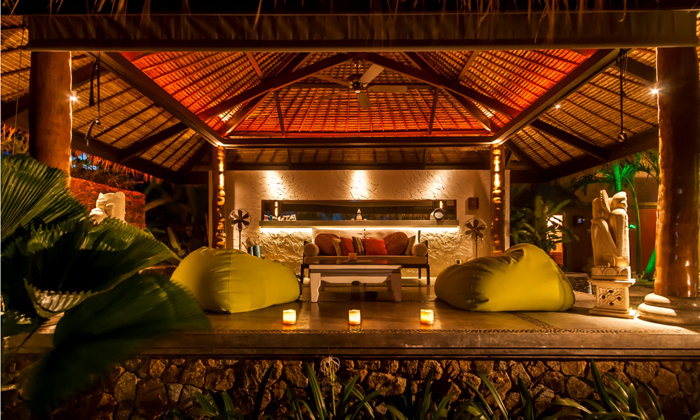 If you adore the feeling of relaxing in the most exotic and lavishing decor then you will simply love the unique Thai ambiance of this 3 bedrooms villa located on the lush hills of Bophut. The simplicity of the design and bohemian details will inspire you to forget about everything back home and indulge yourself for a whole weekend with fantastic scenery, swimming in a private pool, lounging on the comfortable cushions in the evening or exploring the tropical surroundings. Everything here is designed to make your stay perfect. This luxurious villa has a particular beautify as it combines in a very fascinating way both modern and classic influences while managing to impress its visitors with a very extravagant allure. The most remarkable thing about it is that it has access to an idyllic beach. It is the perfect choice for those who want to get the best of both worlds: the intimacy and luxury of a private villa and the exquisite feel and complete relaxation of a beach paradise with pristine white sand. A weekend here means a sophisticated property with modern furniture, high end amenities and an exotic ambiance. An extravagant five bedrooms villa located on the hillside of Bang Por with breath-taking views of the North West coast of the island. A stay here is a truly remarkable experience marked by a spectacular infinity pool, generous sun terraces and exceptional cascading water systems. It is the ultimate exotic getaway for large families and groups of friends who are looking for a spacious and modern property where they can relax and enjoy the beauty of a paradise beach right in the heart of the Gulf of Thailand. 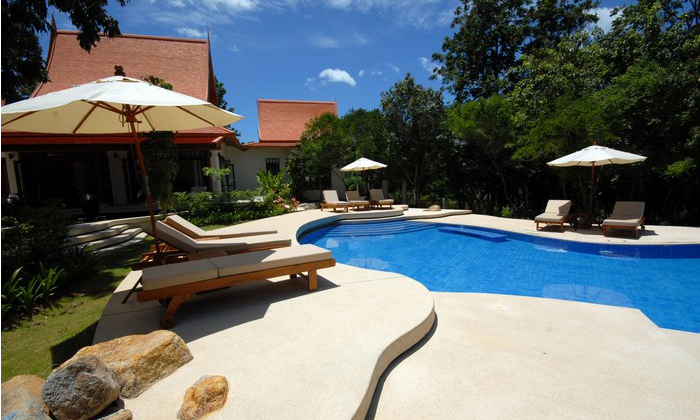 This 3 bedrooms villa with a gorgeous pool and direct access to an idyllic beach in Lipa Noi is a stunning property perfect for spending a couple of days away from the stress and routine. What travelers love about this villa is that it is located in a spectacular part of the island, where fantastic landscapes mix with the proximity of the most amazing beaches, best restaurants and most popular clubs and shopping centers. Also, the property is incredibly modern featuring contemporary architecture, elegant furniture, high end appliances and impressive amenities. This opulent and, frankly, breath-taking villa is located in an area of amazing natural beauty- everything blending perfectly with the unique purpose of transforming each stay here in a remarkable experience. A weekend spent at this luxurious property is rich in delight, the delight of enjoying a very relaxing ambiance, of admiring a lush exotic private garden, of being a part of the impressive beauty that Koh Samui has to offer and more important of having all the comfort and intimacy that you had back home, but in a more extravagant and exotic décor. The essence of a Thai island escape is to be able to enjoy the exotic feel of this experience to its fullest, no matter if it is for just a weekend, for a week or more. And nowadays a true Thai holiday means luxury, fascinating savors, cultural experiences, exploring the sea and the mysteries of a tropical lush jungle. 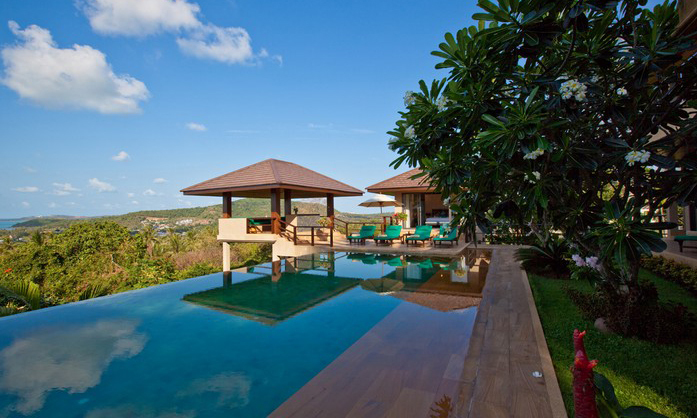 When you are staying at a luxury villa such as this one, all the above are possible. It all starts with its sophisticated interior, lavishing infinity pool, idyllic location and proximity to the most thrilling places on Koh Samui. What To Do In Koh Samui? Sailing around Koh Samui can be one of the most splendid experiences you have ever had. This gorgeous island located in the beautiful Gulf of Thailand is surrounded by numerous wild islands that enchant travelers with deserted white sand beaches, lush tropical forests and exotic sceneries. All these can be either admired from an elegant and luxurious yacht or experienced by foot. Either way, it will be an unforgettable tour. Those who adore sailing and discovering places that exude natural beauty can take advantage ofSamui Boat Charter. One should never miss out on these two picturesque and vibrant islands: Koh Phangan and Koh Tao. 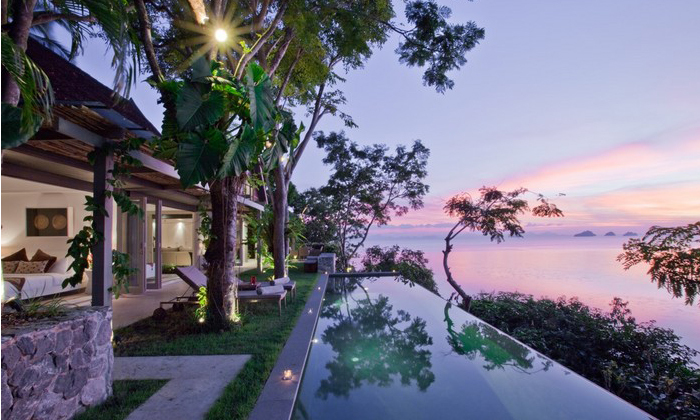 These two gems unveil the fascinating Thai ambiance and the magnetism of a fantastic and exotic getaway. The island of Koh Phangan is located at 18 km north of Samui and this is a more unspoiled and tranquil Thai destination in the Gulf of Thailand. Backpackers prefer this island because it is more affordable and quiet than Koh Samui and it has some of the best full moon parties. For those who adore getting in touch with nature and relaxing while doing this, Koh Phangan has many undeveloped beaches and a few of them can be accessed only by boat. The destination is well-known for its stunning natural rock formations, beautiful waterfalls, bamboo beach bars, young crowd and calm beaches. 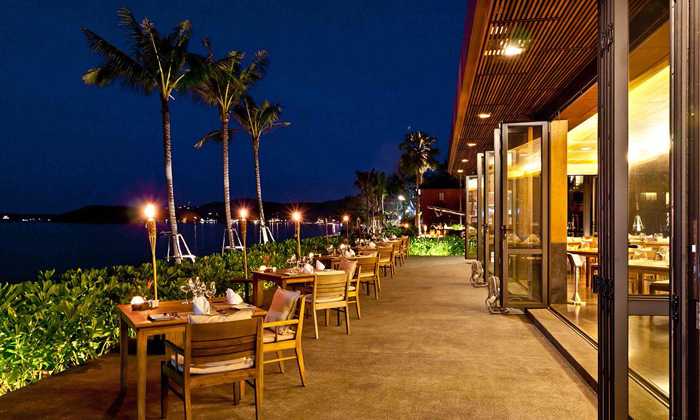 Furthermore, here you will find excellent beach restaurants with authentic Thai cuisine and affordable accommodation. If you want to get the best of Samui and its surroundings then a full day yachting tour on Koh Phangan is definitely a good choice for you. The third largest island in the Samui archipelago is located at 45 km north of Koh Phangan and it is called Koh Tao. Its name has a very special meaning- turtle island as here there is an overwhelming number of breeding turtles. The white sand beaches and thick tropical vegetation that cover the island are the perfect home for them. Those who are passionate about diving will surely want to visit Koh Tao as it is widely known as the best place for diving. These waters are intensively populated by whale sharks. Besides diving, Koh Tao also offers the best places in the Gulf of Thailand for scuba diving and snorkeling. Besides the wonderful anchorages with deep blue crystal waters, the destination also delights its visitors with excellent provisioning possibilities, friendly restaurants with delicious international cuisine and a cozy little harbor town. The best part about discovering these wonderful two islands in the northern part of Koh Samui is that it can be done by boat. A one or a two days yacht tour on these breath taking destinations will introduce you into the unique colorful and vibrant Thai atmosphere. Here relaxation, beauty and untamed nature are at their best. This is the ideal holiday experience for those who adore sailing, diving and discovering unique places that have the power of offering new and amazing cultural experiences. Emerald clear waters, deserted white sand beaches, rich vegetation and unique rocky formations are just a few of the highlights you will find here. Koh Samui has an endless collection of things to do and this is no exaggeration. There are both man-made and natural attractions that wait to be discovered by the adventurous traveler, from the spectacular waterfalls, intriguing grandpa and grandma rocks to the Secret Buddha Garden, Thai Boxing Stadium and Snake Farm. Everything about this island will inspire you to live life to its fullest. 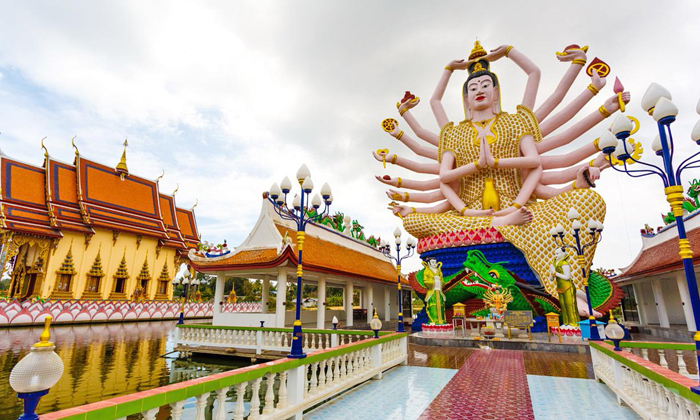 Wat Plai Laem is one of the most spectacular Buddhist temples in Thailand and it is located on the north-east coast of Samui. Its main attraction is the amazing 18 arm gigantic statue of Guanyin, the Goddess of Mercy and Compassion. 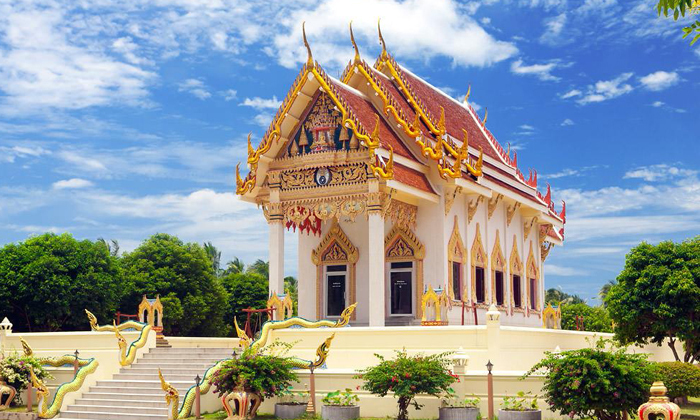 Wat Plai Laem is also very close to the Big Buddha temple and it delights its tourists with a fascinating view of the Chinese-Thai beliefs, intricate architecture and colorful Buddhist-themed art. 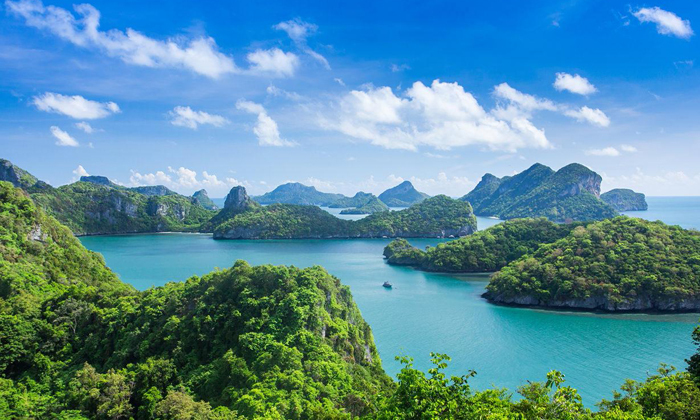 Ang Thong National Marine Park includes 42 of the most beautiful islands you have ever seen scattered along the emerald waters of the Gulf of Thailand. Each one of these pieces of paradise has white-sand beaches, thick jungles, mangroves, mountains, hidden coves, waterfalls and lakes. This pristine archipelago is a protected area of over 100 square kilometers of sea and land, where we can admire an impressive diversity of wonderful sea creatures and exotic wildlife. Diving, snorkeling, kayaking, hiking and sailing are the most popular activities for tourists that visit Ang Thong. Now, let’s face it! A holiday is also about fun and finding entertaining and amusing things to do or see. Well, Koh Samui is the perfect place for this. It has one of the most unusual and hilarious natural shaped rocks- Hin Ta and Hin Yai. These fascinating huge rock formations are located on the south coast. The locals have discovered these many years ago and they have named them Grandpa(Ta) and Grandma(Yai) because they look like male and female genitalia. 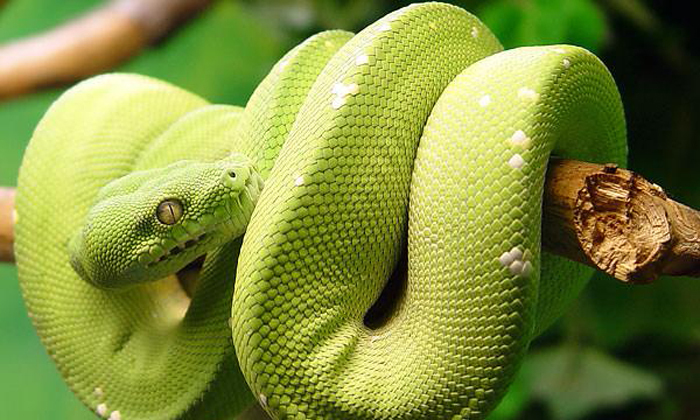 The Snake Farm is your best chance to get a thrilling up-close look at some of the most rare and scary reptiles in Thailand. There are daily shows where visitors can see how daring wranglers convince the snakes to show their impressive fighting moves. The star attractions of these spectacles are giant pythons, king cobras as well as a large diversity of snakes. If you aren’t that impressed with the reptilian show then you can opt for the scorpion or centipede shows. On a small rocky island on Koh Samui north-eastern side there is the Big Buddha temple. 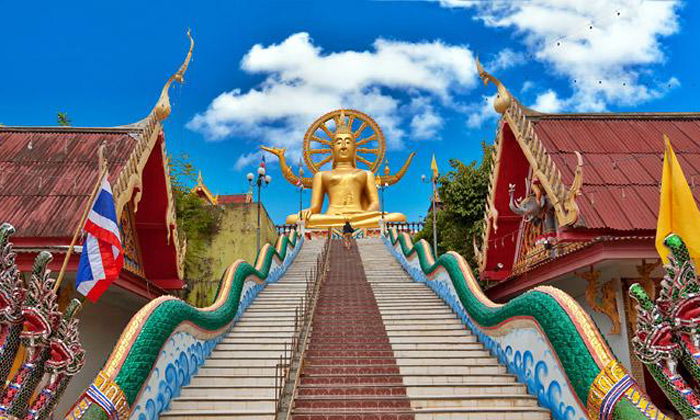 This fascinating tourist attraction is known locally as Wat Phra Yai. It features an enormous 12 meters seated golden Buddha statue. The Big Buddha temple is located on Koh Faan and can be visited by using a bridge that connects it to the main island. When arriving to Koh Samui by airplane, this is the first thing that travelers see at a distance of several kilometers. I got to admit that visiting a mummy isn’t something one dreams of doing during its weekend on a gorgeous Thai island, but the mummified monk at Wat Khunaram offers a good insight into Thai and Buddhist culture. The monk Luong Pordaeng passed away in 1973 in a seated meditative position and from that moment his body has been displayed at the temple in a glass case. The intriguing thing about him is that even after more than 30 years from his death, the body shows little signs of decay. For us, westerns, seeing the body of a man who died 30 years ago is a very shocking thing, but people in Thailand consider this as a good reason to meditate and contemplate life. The beauty of Koh Samui isn’t limited to its beaches or to its cultural richness. The island is also a place that hides majestic waterfalls. Two of these can be found inland and are called Na Muang waterfalls. To reach this part of Samui you just need to follow a walking path from the entrance to the park, about 12 kilometers south-east of Nathon Bay. 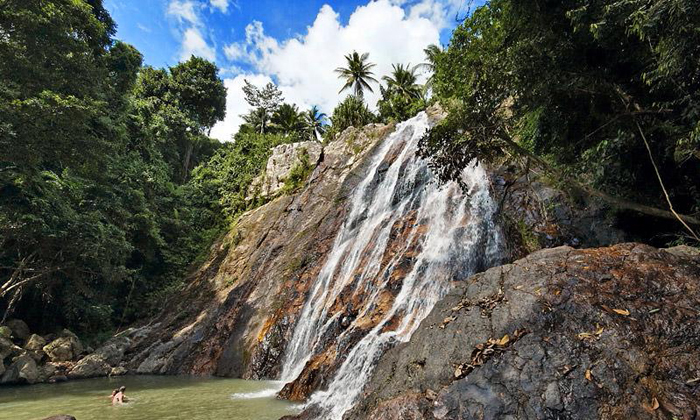 The first waterfall forms a spectacular natural pool at its base which invites you to cool down in the hot days. The second waterfall is smaller and can be found uphill, 30 minutes by foot. These two cascading waters are perfect for families that want to swim and have a pleasant time together during an exotic Thai weekend vacation. Nearby there is an elephant safari camp where you can experience the thrill of elephant trekking. The Samui Aquarium & Tiger Show is a truly wonderful place where you can admire many beautiful and unique exotic wildlife, colorful birds and marine creatures. 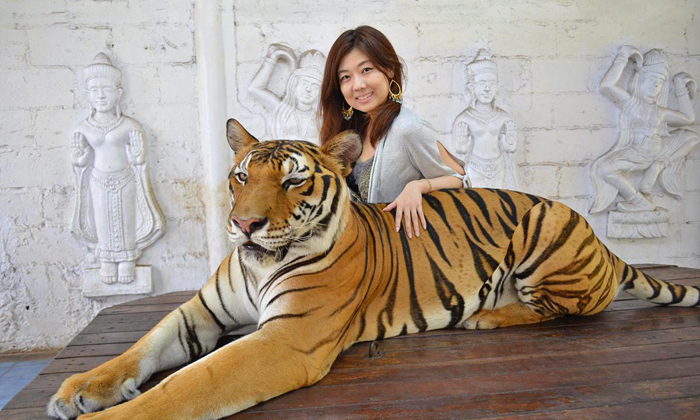 If you are visiting Koh Samui with your family then you should definitely dedicate one afternoon to this entertaining attraction. They will love it and it will surely make their weekend! High in the hills of Koh Samui, the Secret Buddha Garden waits to be discovered by the adventurous traveler. This is actually a collection of unique statues combined with lush jungle which offers breath-taking views of the island and its surroundings. 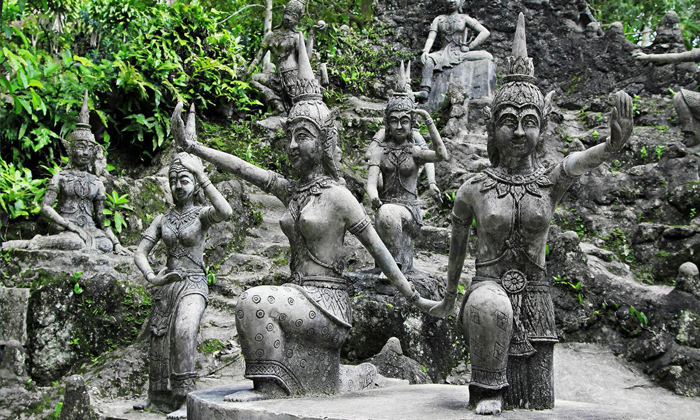 The garden begun to take shape in 1976 when an old Samui fruit farmer named Nim Thongsuk created the first statues and the temples around his home. He continued to work on his secret garden until his death at the age of 91. The name is pretty suggestive, isn’t it? It is that controversial part of Thailand that make you blush. 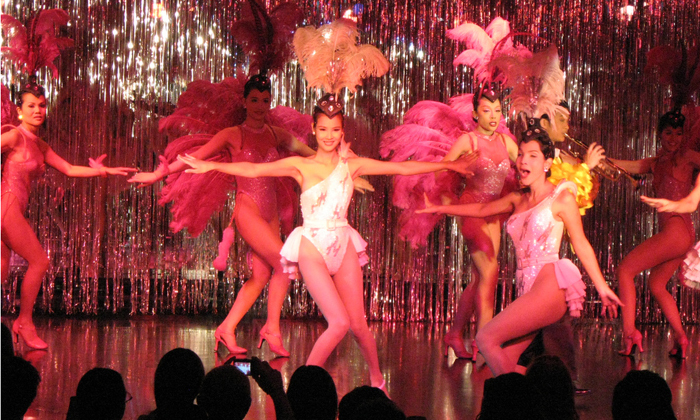 But beyond its sexual connotations, even if the LadyBoy Cabaret isn’t your cup of tea, you should still attend one and understand that it is just another fun and sparkly form of entertainment. For Thai people, this form of entertainment is very popular and it plays an important role in their culture. A typical show implies complex costumes, make-ups, lively dancing and lip-synched interpretations of famous songs. Where To Eat In Koh Samui? One thing you can be sure when arriving on Koh Samui: you will never go hungry. This paradise beach destination has a delightful variety of restaurants with some of the most popular International cuisines. From fascinating and intriguing local snacks to high end International cuisine, every savor is meant to impress your senses. There is surely something perfect for everyone. If you are looking for a popular and famous international restaurant then you should opt for Chaweng beach where there is a high concentration of elegant dining places. But if you are into fair prices Thai food then Lamai is the right place for you. And there is also the choice of dining on the beach under the moon light. Koh Samui has it all! Nevertheless, there are three restaurants that manage to delight all types of tastes and these can be found below. So if you are spending a splendid weekend on the island then you shouldn’t miss them out. You have probably guessed it. Red is the theme here at Red Snapper. There is classic furniture with red sofas, red seat covers, red napkins and red paradise flowers. Even though the interior is not that pretentious, sophisticated or elegant, the restaurant is famous and this is because of its food. The chefs are international legends that like to explore different cuisines and shape innovative menus. 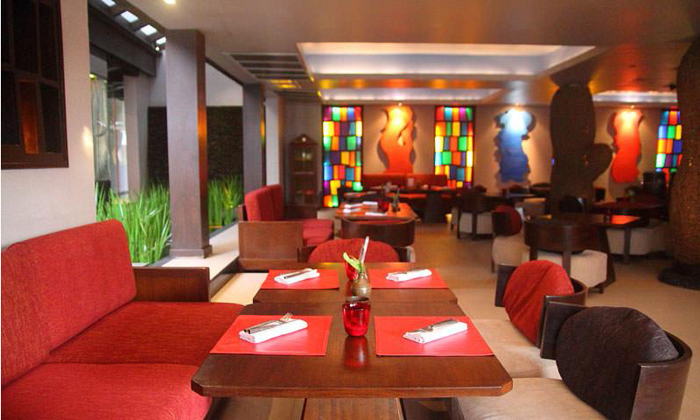 The ambiance is also delightful with abstract art, live music, outside terrace, many plants and lounge areas. It really manages to get you into that pleasant holiday mood. H Bistro is a restaurant that has received many awards and is, without a doubt, the best place to eat in Bophut. Another amazing thing about H Bistro is that it is located near the ocean and when you are dining here you can enjoy a spectacular panoramic view of the emerald green waters. The food is also excellent. The chefs have created a very fascinating French-Mediterranean themed menu and the customers who have special preferences can ask the chef to cook original dishes for them. Lounge restaurant 9 Gems is a very fancy place to eat. 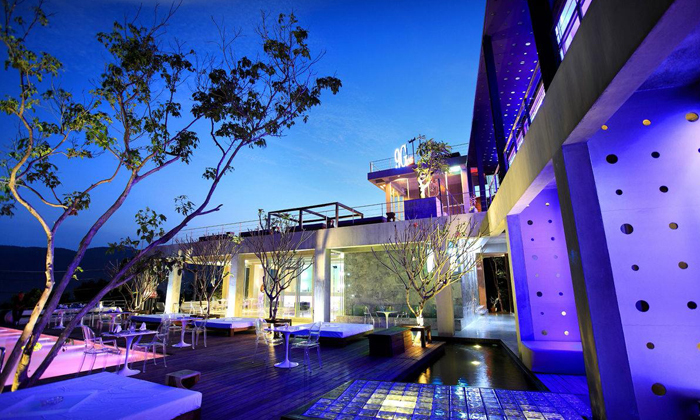 It is located on the hillside of Chaweng and it offers very impressive scenery. The interior of the restaurant is very extravagant and refined, and the outside terrace amazes you with the spectacular views and delightful ambiance. Plus, the food is fantastic. A real pleasure for those who adore to experience the finest International savors.